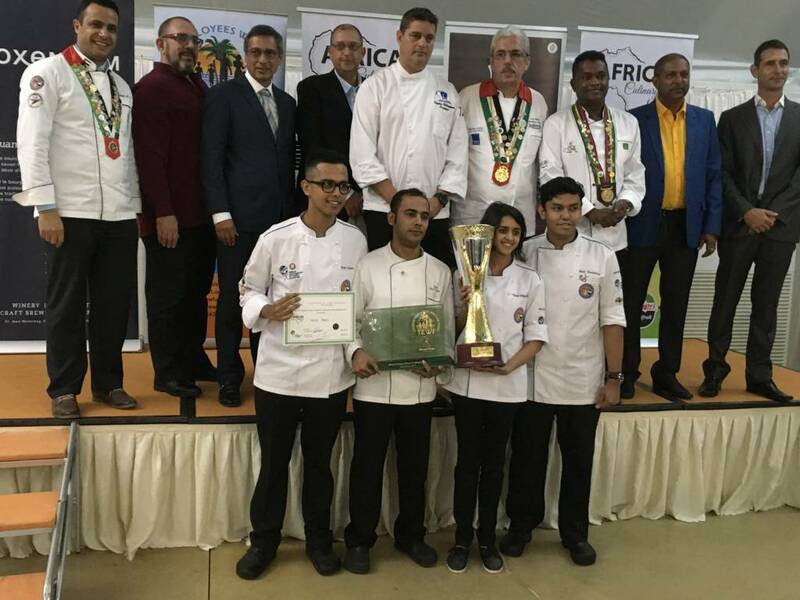 At the African Culinary Cup held in Mauritius on the 30th of September 2017 the Emirates Culinary Guilds Young Chef National Team were competing in the Cup. Led by ChefSagar Khadkikar from Madinat Jumeirah who has led the young team for the past 5 years, the team made up of pastry Chef RushiThammitagefromMadinat Jumeirah, Kavya Krishnamurthy from JW Marriott Marquis Dubai and Aamir Hashmi from Ritz Carlton Dubaicompeted alongside 3 other teams from across Africa, South Africa, Namibia and Mauritius. They had to produce a 3 course set menu for 12 people with only5 hours to prepare the meal from scratch, that was then judges by a panel of Worldchefs accredited judges including Stephen Billingham president of South Africa chefs, Sanet Prinsloo President of Namibian chefs, Uwe Micheel President of Emirates Culinary Guild and President Mooroogun the host and President of Mauritius chefs. The team came up with an excellent well-balanced meal from the mandatory ingredients of Venison, smoked Marlon and Kiwi fruit all being used in one part of the meal. Their efforts were awarded a Gold medal which was an outstanding achievement for such a young team who have only competed2 times together before. The team trained for the past 6 months together every week before the competition at the J.W. Marquis and Madinat Jumeirah under the watchful eye of Executive Sous Chef Steven Peter who was also instrumental in guiding the young team on taste and textures and combinations along with team Mentor chef Sagar. The Emirates Culinary Guild extends its grateful thanks to both chefs for their dedication to the young team. We also thank the J.W Marquis General Manager Bill Keffer and Managing Director Mr Stephan Bollhalder from Madinat Jumeirah for the use of their kitchens and their continued support to the young team and the Emirates Culinary Guild. 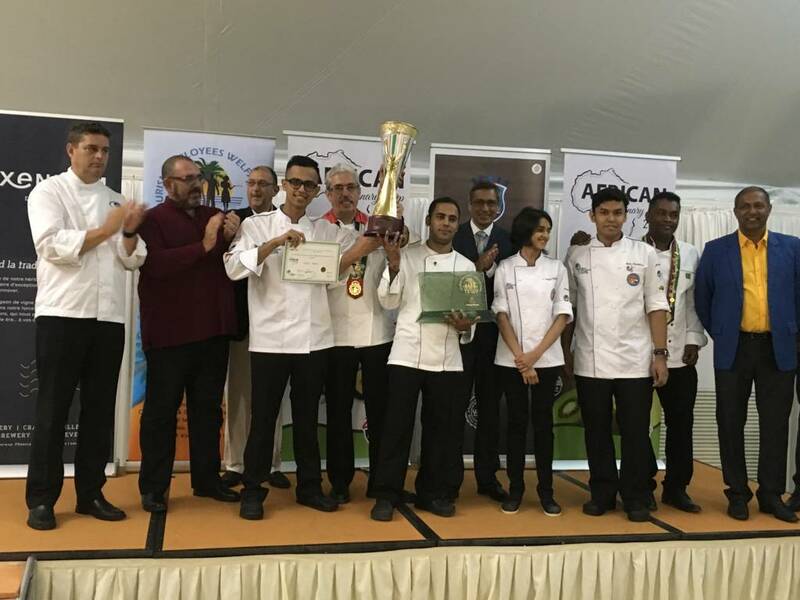 “I was so proud to have been able to travel with our Young chefs team this year to watch them win” said President of the Emirate’s Culinary Guild , Team Manager and Director of Kitchens Radisson BluDeira hotel. This was a great effort from some very dedicated young individuals he added on the teams return. In Mauritius, we were supported greatly by the President of Mauritian chefs President Mooroogun and his entire team who put on a flawless show with the highest levels of organization and camaraderie without who we wouldn’t have been so triumphant. We thank the Mauritian colleagues for all they did to support all the teams. The aim of the young chef national team is to continue working together then traveling for the next ultimate competition experience the Culinary World cup in Luxembourg in November 2018 and before that in Singapore at FHA in April 2018. I would like to thank the team for their professionalism shown at the recent African Culinary Cup and their commitment to the team and each other. We start work almost immediately for Singapore and we are excited for the future.